The Mayline Napoli Wood Veneer U Shaped Desk has an Italian inspired design. Unique curved desk front is functional for meetings and classically styled. Beautiful wood veneer shouts executive and storage is an added bonus. Warranty and free shipping on all office desks. Zira by Global is a office desk series with many options to personalize your workspace. 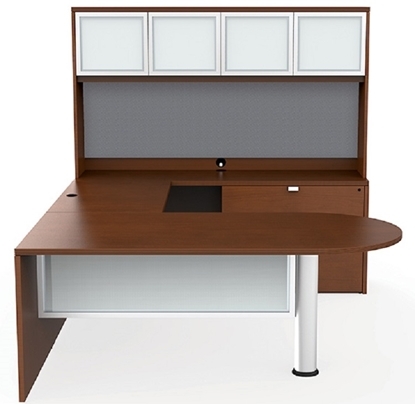 This U shaped desk with drawers meets all of your worksurface needs with more room for storage. Free shipping and warranty available on all contemporary office furniture. Zira by Global is a contemporary desk design with options to personalize your workspace. 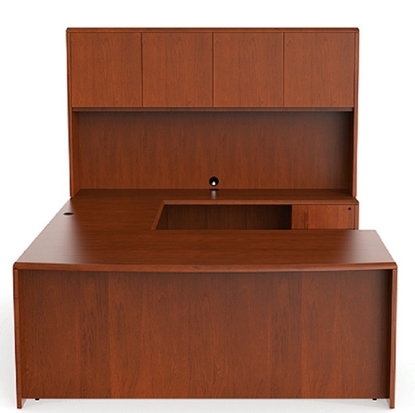 This U shaped desk with hutch meets your work surface needs and storage requirements. GreenGuard® certified eco friendly design. Get free shipping when you order today! The Ventnor series U shaped desk with hutch from Offices to Go offers sophisticated styling with the beauty of genuine wood veneer. Plenty of storage and work space for an executive office or home. Certified eco friendly design. Free shipping and warranty on all discount office furniture. 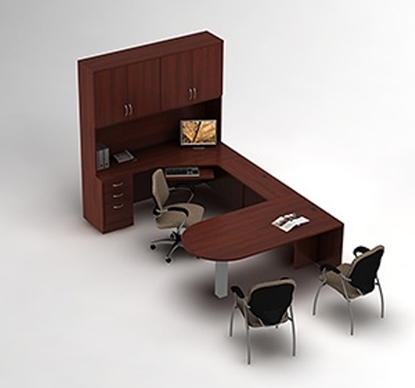 Zira by Global is a contemporary U shaped desk with hutch with extensive options to personalize your workspace. This desk meets your work surface and storage needs at an affordable price. Most components ship fully assembled. Premium full extension progressive ball bearing slides on file drawers. Eco friendly GreenGuard® certified. Get free shipping when you order today! Mira from Mayline is a series that features simple curves that create an elegant setting for any work environment. This U shaped desk with wood veneer features a 1 1/2" thick hardwood edge and a bow front. Perfect for a laptop computer or desktop PC. Free shipping and warranty available on all discount office furniture. This modular U shaped desk is designed to build out from where you work unlike most traditional desk systems which are designed to build out from the wall. The Princeton series from Global is designed for a generation that believes the office doesn't have to look like "the office" in order to perform. Overlapping work surfaces render a flexible footprint that is simple to reconfigure. Get free shipping when you order today! This U shaped desk with hutch features a 1 1/2" thick hardwood edge and a hutch with glass doors. Mira from Mayline is a wood veneer desk series that features simple curves that create an elegant setting for any work environment. Free shipping and warranty available on all office furniture. 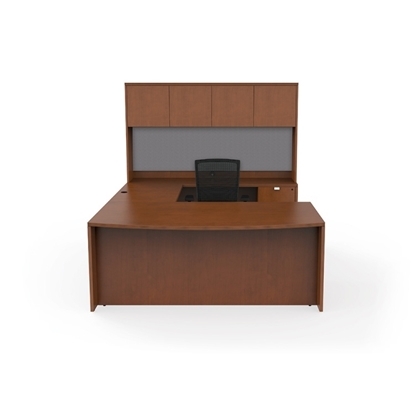 The Mayline CSII series U shaped desk with hutch provides a modern look with radius overhead doors and clean lines. The hutch provides additional storage space. Eco friendly to reduce impact on the environment. Free shipping and warranty available on all office furniture. This Executive U shaped desk, in a high quality, durable laminate finish, is a good choice at work or in your home office. It offers good work surface space and storage below the tops and in the overhead hutch. The companion lateral file can be placed anywhere you wish and provides additional filing capacity. 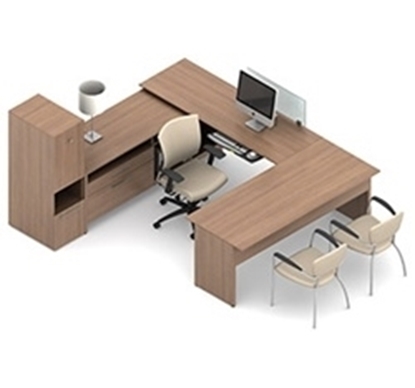 Make a great first impression with this U-Shaped Office set up. 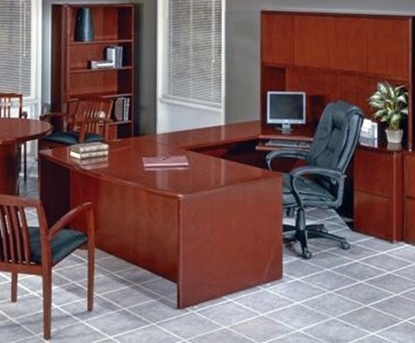 This U-Shaped Desk Typical features a double pedestal U-Shaped Desk with Hutch and a matching Lateral File and Hutch. This unit is available in 4 different colors and features a 1 5/8" thick work surface. This unit can be used in the home or in the office and is designed to make your workplace feel like home. 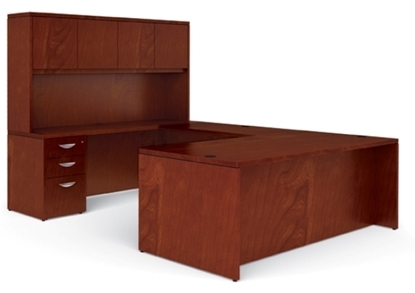 A wood veneer U-shaped desk that features a lateral file for all your filing needs. This desk constructed with 3 ply balanced construction and 1 1/8" thick work surfaces. This unit also includes a fabric tack board between the credenza and hutch. A wood veneer desk that combines lots of work space with plenty of storage. This U-shaped desk features a peninsula front design with full modesty panel and a mixed storage cabinet featuring a single lateral file drawer, a standard file drawer, and two box drawers for all your storage needs. 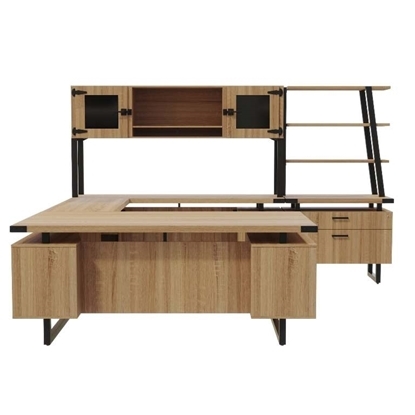 The RU-256 U-Shaped Desk offer an ample amount of workspace and storage. 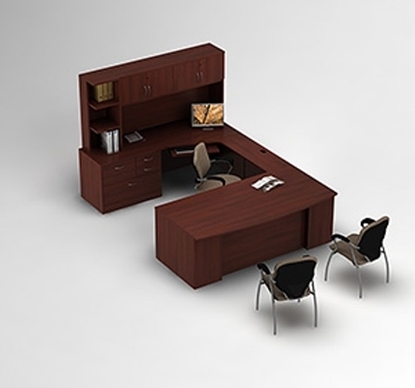 It's Bow front design is ideal for holding small meeting in your private office and its unique color offers a very executive look. Built with a stylish wood veneer finish, this desk encompasses style and function at a great price. This desk features 1 1/8" thick work surfaces, three file drawers and two box drawers, and includes a fabric tack board. 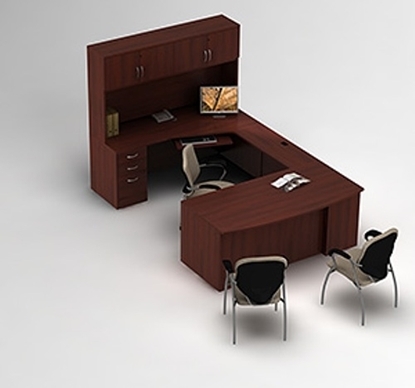 This U shaped desk with storage cabinet is designed to build out from where you work unlike most traditional office desk systems which are designed to build out from the wall. Overlapping work surfaces render a flexible footprint that is simple to reconfigure. GreenGuard® certified eco friendly design. Free shipping and warranty available on all contemporary office furniture. 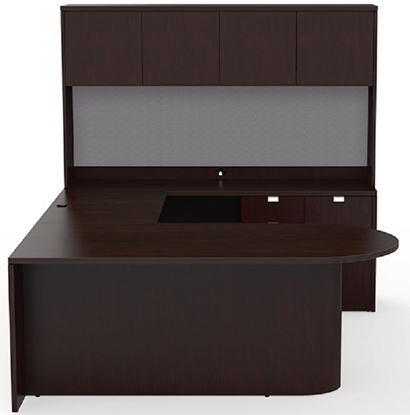 This U shaped desk with hutch from Global meets all of your work surface needs in your office or your home office. Zira is a commercial-grade contemporary desking solution with extensive options to personalize your workspace. Most components shipped fully assembled. Premium full extension progressive ball bearing slides on file drawers. 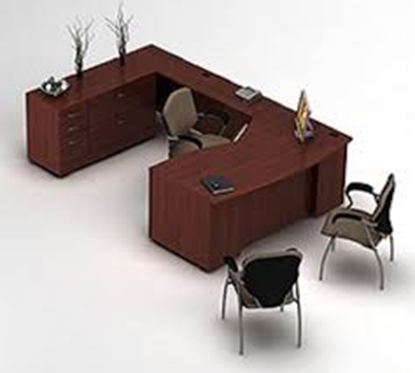 Sonoma's U shaped desk with drawers features a multi-radius wood veneer design, beautiful in any office environment. Perfect for a home office or business. The wood veneers give a professional look at an affordable price. Free shipping and warranty on all Office Star furniture.